Shelly is a turtle-like robot that can help kids learn the rewards of being kind to their companion robots—and the consequences of being bullies. Observations of how children interact with Shelly are described in the paper, "Designing Shelly, a Robot Capable of Assessing and Restraining Children's Robot Abusing Behaviors." The authors are Hyunjin Ku, Jason Choi, Soomin Lee, Sunho Jang and Wonkyung Do. Their explorations with this robot should spark interest among researchers as to how to engineer a robot that can restrain children's abusive behavior. 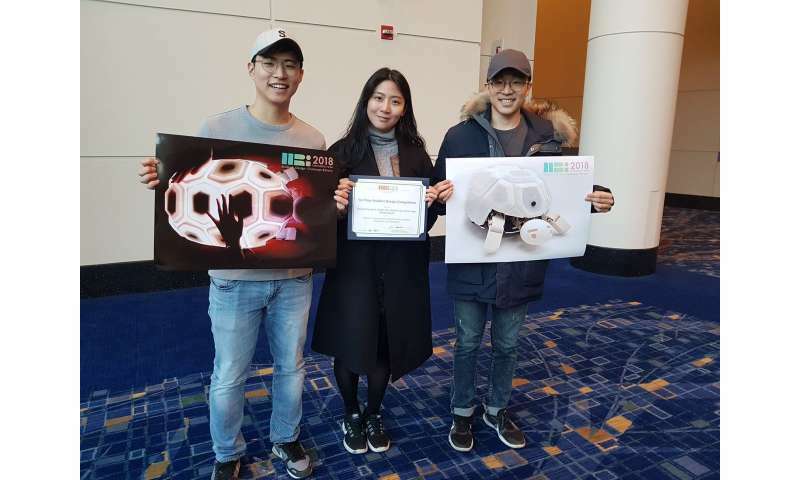 The team, with affiliations from Naver Labs, KAIST, and Seoul National University, presented their work at the ACM/IEEE International Conference on Human Robot Interaction. Shelly's functions and characteristics certainly go beyond any simplistic try such as a recorded message that tells them "Don't Hit Me" or "Be Nice." Rather, the researchers have given Shelly a touch, physical and graphical interface for non-verbal interactions with children. Through certain behaviors, Shelly offers a lesson: I won't actively play with you if you are abusive to me. And the lesson is a carryover they can take home: Don't abuse robots. Researcher Jason Choi said, "since the children perceived Shelly as robot, we believe that they also learned that abusing other robots is wrong." This is not the first time that researchers have taken a look at children misbehaving with robots. Interesting thought: If a child delights in pulling hair off her dolls' heads, what will she do to the little space robot with wide, empathy-like eyes, designed to melt hearts? One team in Japan wrote a paper, "Why Do Children Abuse Robots?" The authors had affiliations at Ryukoku University, Tokai University and a robotics lab in Kyoto. The researchers carried out the study in a shopping mall in Japan. The robot was human sized and humanoid. The children persistently obstructed the locomotion of the robot even if the robot uttered a request for the obstruction to stop; they were kicking, punching and beating the robot; folding its arms, bending the joints of its arm and head. When is human likeness too much of a good thing? But now researchers have another question. When is cute animal likeness a good thing and when is it too much of a good thing? How likely are some curious children aiming to see what happens when they give the cute animal a royal slap and kick? In this Shelly experiment, actions such as hitting and kicking were considered as abuse. So, what is Shelly like? Stephanie Mlot in Geek.com: "The tortoise-shaped toy is fun to play with, lighting up and dancing—until someone presses too hard or whacks it. Sensing danger, the bot's head, arms, and legs retreat into its shell, hiding until it feels safe to come out again." A video posted on March 14 showed a group of children patting Shelly in a positive manner. They rubbed their hands over the machine shell in a friendly way. Children learned that doing so made the robot happy. They learned that treating it badly caused it to hide in the shell. Actually, the turtle has embedded LEDs and vibration sensors that can detect touches and impacts, said Evan Ackerman in IEEE Spectrum. "Using its LEDs and limbs, Shelly conveys different emotional states, including happy, sulky, angry, and frightened." If it is in that frightened state, then the robot's lights turn off. Limbs pull back for 14 seconds, said Geek.com. Children through observation got it: if they wanted to keep Shelly active, they could not abuse it. Interestingly, the young participants "often advised or condemned others who made that mistake." There was a group pressure dynamic going on, but in a positive way. In a Q&A with IEEE Spectrum, Choi explained the finding. Choi said there had been several field tests at the same place, so some children already had experience with Shelly. If Shelly ceased interacting because of abuse, "the others in the group who wanted to keep playing with Shelly often complained about it, eventually restraining that child's abusive behavior if that behavior continued." Another interesting outcome was the length of time for Shelly to hide, in pulling into her shell. The number of seconds mattered. "To determine the most effective length of hiding action, we conducted a between-subjects study with varying length of hiding: no-hiding, 7, 14, and 21 seconds," they wrote in their paper. Too little a time spent in withdrawn state triggered abuse. Too long a time triggered boredom and the chance a child would just walk away. The authors wrote, "We think that when the hiding only lasts for a short length, Shelly's hiding reaction is perceived as a reward and triggers children's aggressive behavior even more." The researchers determined that, "to effectively restrain robot abusing as well as maintaining children's engagement, the appropriate operating time of the function can be determined as 14 seconds." Shelly's two modules are its shell and its stomach. For the shell, proximity sensors were embedded in vertices, detecting children patting the shell. Vibration sensors were attached to the interior of the shell to detect children hitting the robot. LEDs attached to the surface of the shell serve as the graphical interface; the stomach module comprises limbs, head, and wheels—Shelly's physical interface. The authors said that, as for the hiding-in-shell function, in-and-out movements of limbs and head were synchronized by a ball screw mechanism. What's next? "We're also developing a touch pattern recognition system based on machine learning methods, using the tactile interface of Shelly's second prototype. We were able to detect touch patterns such as stroking, rubbing, or hitting by more accurately using this classification method," Choi said in IEEE Spectrum. Does Shelly really restrain behavior abusing robots? "Results showed that Shelly's hiding technique was able to significantly reduce children's abusive behavior," said Ackerman.